1. Send Special Rapporteurs and Embassy representatives to investigate the situation of arbitrary detention, inhumane prison conditions and lack of legal due process in Vietnam. 2. Demand the Vietnamese government to respect the Universal Declaration of Human Rights and repeal vague national security laws such as Articles 79 and 88 of the Vietnamese Penal Code which are often pretext for arbitrary arrest and detention. 3. 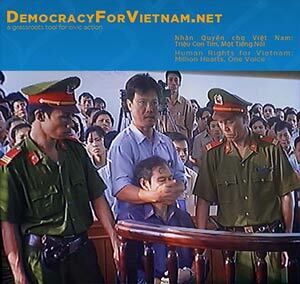 Urge the Vietnamese government to immediately release all political prisoners”. Faced with increasing grassroots demands for political change, the Socialist Republic of Vietnam government is resorting to internet censorship, sham trials and arbitrary detention to enforce its oppression. Meanwhile, the Vietnamese government apparently believes that by joining the UN Human Rights Council, it can blatantly continue to ignore the Universal Declaration of Human Rights and the International Covenant on Civil and Political Rights to which it is a signatory. On the occasion of 2012 International Human Rights Day, we call on the international community to stand by Vietnam’s voices of conscience: bloggers Dieu Cay (Nguyen Van Hai), Ta Phong Tan, Paulus Le Son; democracy activists Nguyen Quoc Quan, Tran Huynh Duy Thuc; song writers Viet Khang, Tran Vu Anh Binh; human rights attorney Cu Huy Ha Vu and Reverend Nguyen Van Ly. These are but some of the many patriotic Vietnamese who have peacefully expressed their views and pursued nonviolent methods to demand democratic change, religious freedom and social justice. Many Vietnamese prisoners of conscience face harsh conditions in jail such as forced labor, physical abuse and denial of medical treatment. According to international human rights organizations, two especially appalling cases involve female political prisoners: land rights activist Tran Thi Thuy and labor organizer Do Thi Minh Hanh. 3. Urge the Vietnamese government to immediately release all political prisoners. On behalf of the peaceful activists detained in Vietnam, we ask the international community to hold the Vietnamese authorities responsible and accountable for the well-being and the deprivation of liberty of these brave individuals. og styrkelse af mediekompetancerne for eleverne på skolen og beboerne i lokalområdet. se vores nye lokaler og hilse på nye og gamle medarbejdere. Aarhus Global Media er et projekt under Europæisk Kulturhovedstad 2017, som har til formål at arbejde med etniske minoriteter på det lokale og europæiske plan. Vi har derfor etableret European Community Media Center for Diversity and Intercultural Dialogue. I den forbindelse har vi fået europaminister Nicolai Wammen til at holde åbningstalen. ind i et helt nyt lokalt og europæisk perspektiv. Vi håber, at I fortsat vil bidrage med inspiration og støtte til opbygningen af en helt ny form for nærvær i mediebilledet til gavn og glæde for lokale som europæiske borgere og brugere.